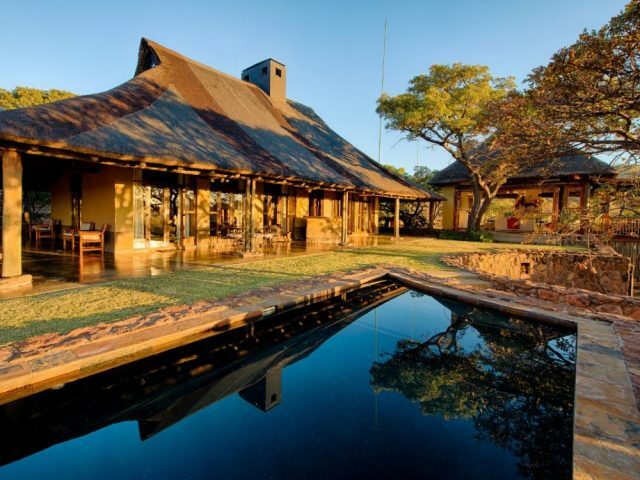 Jamila is a great place to head for a weekend, whether with family or friends or a romantic break in the bush! We love the fact that each of the bungalows has its own jacuzzi on your private porch which overlooks a waterhole – a great way to combine romance with game viewing! Welgevonden still doesn’t have the same reputation as the lowveld reserves in terms of game viewing (and off-roading isn't allowed either) – then again it completely blows them away as far as beautifully scenic landscapes are concerned! 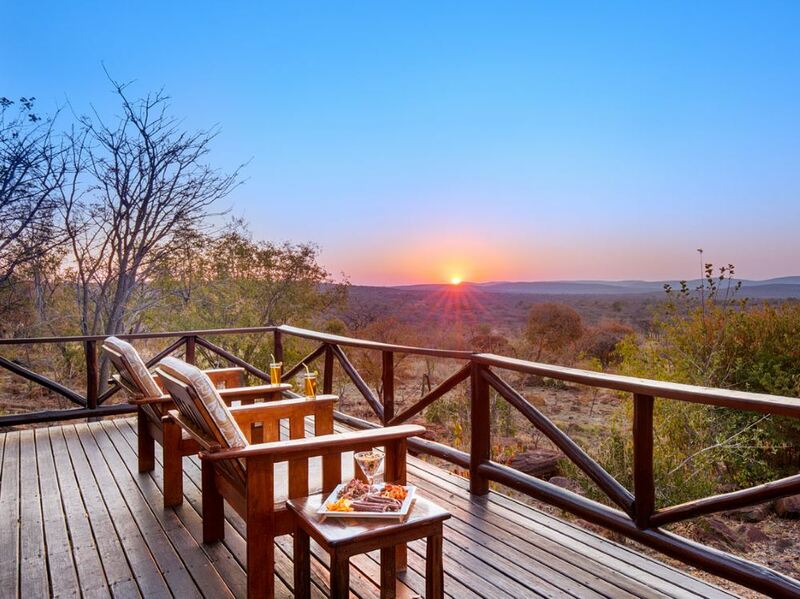 the highlight for us has to be the private deck with jacuzzi set in a rock feature in every suite – what could be better than enjoying a glass of wine with your better half as you look out on the bush whilst soaking in the hot, bubbling water! 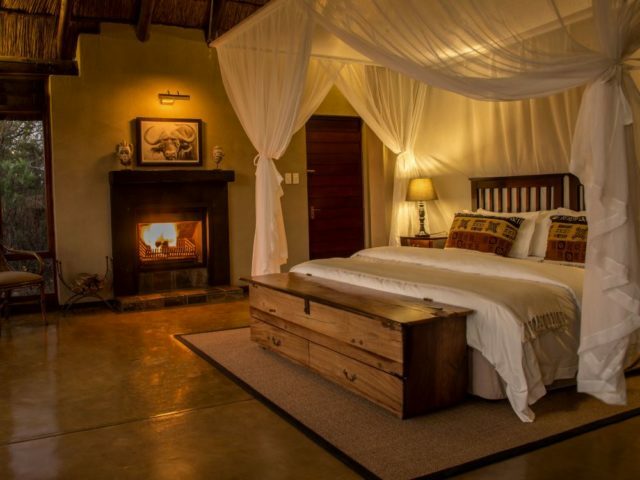 Situated in the northern reaches of the Welgevonden Private Game Reserve, Jamila's safari experience is malaria-free and offers you a relaxed and intimate getaway within this pristine Big Five wilderness! The reserve is inhabited by a variety of birds and mammal species and covers some 37 500 hectares of unspoiled wilderness! The lodge itself is surrounded by striking Wild Seringa trees and sports lovely views from its hill-top position. This is a solidly 4 Star lodge with each of the five stylish bungalows boasting an en-suite bathroom and an outside shower from which you can enjoy views out into the surrounding bush. It's also perfect for a cool refresher in the heat of the Waterberg summer, whilst in winter you can tuck into fluffy complimentary robes and curl up with a book! 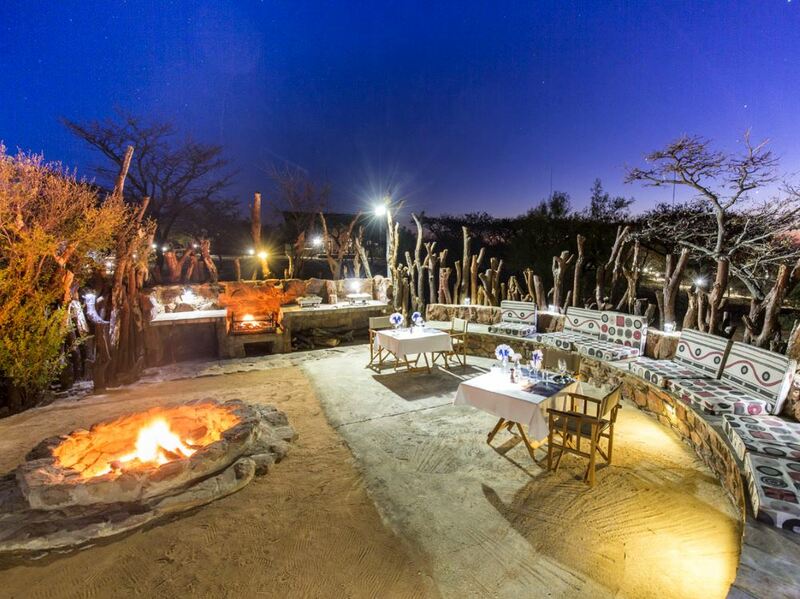 The highlight for us though has to be the private deck with jacuzzi set in a rock feature in every suite – what could be better than enjoying a glass of wine with your better half as you look out on the bush whilst soaking in the hot, bubbling water! There might only be 5 rooms in total at Jamila – like virtually all of the Welgevonden lodges Jamila is small and intimate – but these are actually divided into 3 different types: there are 2 Standard Bungalows, then 2 Luxury Bungalows (which feature huge king-size beds versus the 2 singles pushed together in the Standards) but our favourite has to be the spacious Family Bungalows which add a couple of double sleeper couches in the lounge area for the kids to the king size in the bedroom. This Family Bungalow also features something that will no doubt be loved by guests in the chilly winter months, a fireplace in both the lounge area and next to the bed! 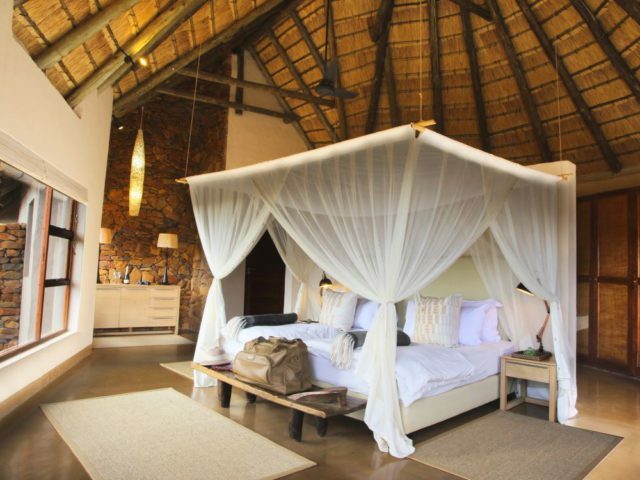 All of the suites have a true African feel to them with thatched roofs, exposed stone walls and romantic crisp white mosquito nets draped over your oversized bed on which the raw wooden base is exposed! One of the unusual aspects about the rooms at Jamila is that the beds have all been placed away from the walls in the centre of the floor space which adds an airy and light feel to the rooms. The bed also has magnificent views of the surrounding valley and mountains with the bungalow's glass windows and doors – here you don't even have to get out of bed to see Africa at its best! The main lodge building is also comfortable with having the ostentatiousness of many of the top end lodges. There are comfy sofas placed around a crackling fireplace in the main lounge area which also has a adjacent dining table for when the weather is dodgy and meals have to be taken indoors. Much of the time though you'll dine on the deck overlooking the pool and the gently illuminated waterhole – in fact this waterhole offers excitement throughout the day where a variety of animals quench their daily thirsts! An even better dinner option for us is in the atmospheric boma with its evocative lamplight adding an irresistibly authentic and romantic feel! On those hot and sunny days you can also cool down and enjoy the refreshing swimming pool while having a drink from the bar and relaxing on the pool loungers. As far as the game viewing is concerned, the Welgevonden just gets better and better as the game numbers have grown so much since the initial restocking of the area back in the 90's. With only a limited number of people having access to the reserve at any one time – in fact no private vehicles are permitted – it combines great game viewing with some of the most spectacular scenery of any reserve in South Africa! On your twice daily game drives conducted by a professional game ranger who will share with you their exceptional knowledge of the bush, animals and the surrounding area, you'll have a great chance of spotting most of the Big Five (leopards as always can be tricky) as well as many other species of endangered and unusual game, not to mention an estimated 300 species of birds (including the rare and iconic blue crane) As mentioned before, this piece of land has been reclaimed from its previous state of farmland, with the re-establishment of wildlife to this area now provides a sanctuary to some of Africa’s most endangered species – in fact it includes the largest populations of white rhino on a private reserve anywhere in Africa! The bushveld savannah with the surrounding scenery of the mountains and valleys makes for a paradise for grazers and predators alike! The grassy plains thrive with antelope and the predators like cheetah and lion are never far behind so keep those eyes peeled! The area will soon expand to approximately 100 000 hectares of pristine Big Five land as the game fences are being removed between Marakele National Park and Welgevonden! Add in the temperate climate and the fact that it's malaria free and Welgevonden makes a great all year round destination! The 5 lovely suites of Ekuthuleni enjoy a prime position on the game-rich plains of the central part of the Welgevonden reserve. Intimate lodge of just 7 rooms which enjoys a prime position right in the heart of this up-and-coming and very scenic Big Five reserve. Nungubane is known for the warmth of its welcome, the friendliness of its staff, and for its magnificent, tranquil ambiance.